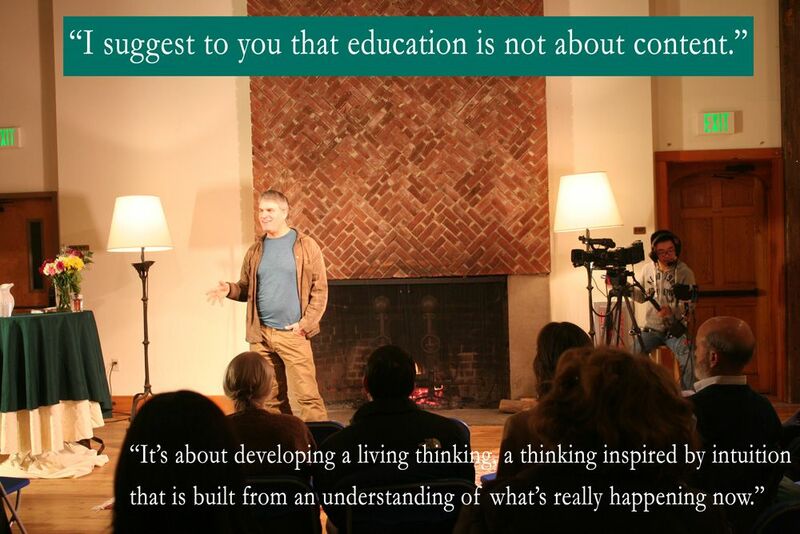 On January 20, Michael D’Aleo, Waldorf teacher and scientist, spoke at High Mowing School about developing intuition in high school students. D’Aleo studied mechanical engineering at Rutgers University, and as a mechanical engineer he received 17 patents in seven years. But at the end of the seven years he had a question: what is intuition? He posed this question to his friends and colleagues, and he was told again and again that he should visit a Waldorf school. In the early 1990s he visited the Waldorf school in Saratoga Springs, New York. There D’Aleo started to teach science, and co-founded the Saratoga Springs Waldorf High School. He now travels around the country helping schools develop their science programs and giving talks on the nature of thinking. D’Aleo spoke at High Mowing about how to develop “living thinking” in students—thinking that is flexible, that reacts to changes in perspective and circumstance, rather than being contained to a set of memorized facts and stale content. In Waldorf schools, that dynamic style of thinking is consciously developed, and it is that sort of education, D’Aleo said, that students need if we are to prepare them for the 21st century. The talk was the first live-streamed event from High Mowing School. Students in the HMS digital arts program set up lights, cameras, and microphones to broadcast and record the talk. The students operated the cameras throughout the broadcast. Watch the entire talk here, as it was live streamed, or read on for a summary. To develop the ability to think dynamically, D’Aleo said a foundation needs to be laid early. Too often we start teaching direct content beginning in first grade, and when we do that we are engaging in “call and response” education. Instead, early education should focus on developing observational skills in preparation for the type of dynamic thinking that is developed in a Waldorf high school. Young Waldorf students are taught to closely observe the world around them, to notice subtleties, differences, and patterns. When the students reach ninth grade, they begin to mathematize the world they are observing. Pairing algebra and their senses, the students interactively tackle questions instead of memorizing the answers. In tenth grade the questions posed become more complex and sequential logic is employed to answer them, imparting to the students an understanding of the backbone of modern computer systems, our logic system, and more. In 2002, D’Aleo read groundbreaking research by Peter Higgs—known for discovering the Higgs boson particle—in which Higgs postulated the existence of the “Higgs field,” a theory that all energy and matter were the result of the relational qualities of the world around us. After reading that work, D’Aleo started to instruct his students and the teachers he mentored to consider the world not as a series of static objects and laws, but instead as the manifestation of relationships. In 2013, after work at the Large Hadron Collider near Geneva Switzerland confirmed his theories, Peter Higgs won the Nobel Prize in Physics for that work that has informed D’Aleo’s teaching style. “In the Waldorf School high school at Saratoga Springs, we’ve been talking about the Higgs field for a decade—in 11th grade,” D’Aleo said. These relational qualities of the world around us are introduced to Waldorf students in 11th grade in the Electricity and Magnetism block, and through that understanding of relationships the students can be taught the basics of many modern technologies. In 12th grade Waldorf students study astronomy, and the students see how one’s position on Earth changes one’s relation to the stars. D’Aleo described how the arc of the moon and the swing of the stars changes if you’re on the North Pole, in New Hampshire, or on the equator. “Same earth, same stars, same moon, same sun. Three different locations, three different motions, three different sets of relationships.” Developing the ability to think from a point of view, discard that view, and then see from an entirely new one is the final step in developing a dynamic style of problem solving. Yes, we have had the pleasure of hosting Michael at High Mowing for several visits. He is working with our science teachers and we were so pleased to have offered this community presentation when he was last here. We feel very fortunate to have the opportunity to engage with him over this extended time! Have you ever met Michael?